Meijer was founded in 1934 as a supermarket and is credited with pioneering the modern supercenter concept in 1962. The company is also considered to be amongst the largest private companies in the US. With groceries, health & beauty, clothing & jewelry, things for the home, toys, electronics and more, Meijer.com is definitely a site that can help you find just about anything that you are looking to buy. 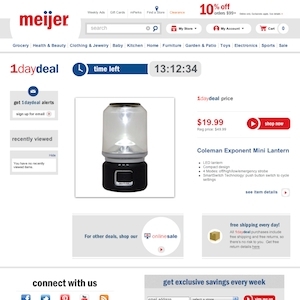 Meijer.com currently ranks #29 amongst sites offering online deals -- MacUpdate ranks #28. In the General Merchandise category, Meijer ranks at #19 -- Ideeli ranks #18.